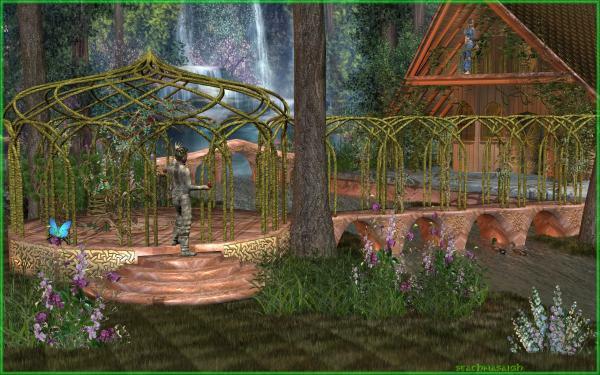 Includes elvish gazebo, trellised causeway, end pier for causeway, and an arched footbridge for the background (not fit for closeups). These props have deep foundations to allow for uneven terrain. Also has ivy clusters for the gazebo and for the causeway. Poser props (pp2) reference OBJs at "geometries\seachnasaigh\Galadhon gazebo". The OBJs are UV mapped and have material zones assigned. Also included are mc6 material application files for Poser 6+. If using the Poser props, load the gazebo first, as the other parts are parented to it. Load the causeway before loading the causeway ivy, because the ivy is parented to the causeway. The trelliswork uses the bark texture from the rdna "Old Forest" set; if you don't have it, then when Poser asks you to locate "TrBark001", browse to textures\seachnasaigh\Ivy Generator and select the "ivy branch" image. Or, you can substitute any other bark texture you have which you like. Several of the materials use displacement mapping. Having looked at the mesh, UV mapping, etc, I despair of fixing this. How about I make you a new one? Thank you for the heads up, Perpetual Revision. This was one of my first models (and zip packing attempts), so I'm not surprised there would be an error. Just noticed your Readme comment about the bark, so I put a copy of a different bark texture in the folder the prop file points to. But the other textures are nowhere to be found. I just deleted them from the material node setup for now, as I think those files were mainly for enhancement. Thanks for sharing all your elvish creations! Splendid work! Thank you for all your freebies!! !